Alright gamers, it's time to stow away your gaming mice, high-tech keyboards, and wrist braces: Valve's Steam Controller and Steam Link plus the Alienware and Syber Steam Machines are now up for pre-order, set for official release on November 10. If you're thinking, "Finally!" you're not alone. After starts and stops, Valve's answer to delivering convenient PC gaming to the living room is finally on the way. The new Alienware Steam Machine is basically the Alienware Alpha we've make the rounds, except this time it's running Linux, not Windows, and it's packaged with the Steam Controller. The console will bring Steam's legendary library of over 1,000 games to the sought-after comfort of a gaming while lounging on the couch. It boasts Intel dual-core i3 processors, Nvidia GeForce GTX GPU 2GB GDDR5 graphics and, most importantly, the ability to play your favorite Steam games on your TV. The going rate for the limited-quantity pre-order starts at $449 (around £292/AU$585). 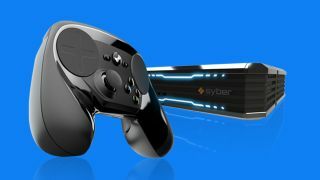 The Syber Steam Machine, hailed as being "built by gamers, for gamers," is offered in 3 units, the I, P and X models, in order of increasing power. Syber's Steam console can pack Intel i3, i5, or i7 dual-core processing, depending on the model you choose. The I model is the value entry into Syber's Steam gaming, where the X model is built for the serious gamer, packing the latest and greatest in graphics and processing. Depending on the Syber Steam Machine you choose, the cost starts at $499 (around £325/AU$651) and goes all the way up to $1,419 (around £924/AU$1848). As for the long-awaited Steam Controller, Valve is aiming to seamlessly translate the use of a keyboard and mouse to a handheld controller, compatible with all your Steam games. The controller includes two trackpads, HD haptic feedback, dual-stage triggers and control schemes that customize your whim and wish. The Steam Controller is up for pre-order at the price of $49.99 (around £33/AU$65). Finally, the Steam Link is also priced at $49.99 (around £33/AU$65.) The Steam Link, which can be bought in a bundle with the Steam Controller, is a set-top box meant for quickly and easily accessing your Steam library on the TV. By connecting it to your home network and television set, it will "automatically discover any computer running Steam," according to Steam's site. If you decide to take the plunge on any of these devices and pre-order now, Valve says your device will ship on October 16, almost a month before it officially hits the shelves. If Steam's answer to the console proves to live up to hype, those who pre-order could have a head-start on the future of gaming. Read up on Steam OS!